A fun experience, I felt it's biggest flaw lay in its open endedness. Like traditional board D&D, you get to create your own character from the ground up, selecting the polygonal appearance, voice, character portrait, and even writing the story. The NeverWinter Nights engine fairly accurately translates the D&D 3rd edition rules to a computer environment, naturally much is lost with the broad scope of D&D and the time constraints of making a video game, but if you have any understanding of the videogame design process you'll appreciate what did get translated. I think the biggest fault in NWNs is the open-ended nature that they tried to give the game. I never felt it offered anything interesting in terms of alignment choice; whether a Paladin fighting for the good of Neverwinter or a Rogue mugging and murdering the remaining living inhabitants of city, you get the same story and the same ending. The game has only one generic ending regardless of how you role play. So again, if you're fighting on the side of good and nobility your ending is no different if you're a cut-throat villain who only wants to save the world from certain peril so -you- can hold that power . . . you get the same ending. I would have preferred to see endings based on the characters alignment (at least) and I really would have loved to have seen even more character-specific endings, alas, that's something that would prove very difficult to accomplish outside a face to face D&D session where the DM can write the endings as he sees fit. 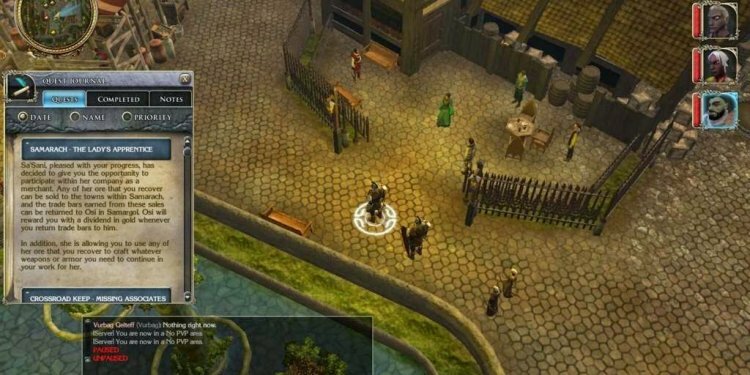 NeverWinter Nights, itself, loses momentum by the time you get to the third chapter  usually your character is on a treasure hunt for 3 or 4 special items and performing various optional sub-quests in each area you have to explore. There really isn't enough variety in NeverWinter Nights to sustain its initial momentum through all four chapters of the game (though, thankfully, Ch 4 is different and shorter.) The Expansion pack carries a little more of a dynamic quest, and it doesn't go on longer than it needs to so in the end it's a better experience I think . . . even if the henchmen aren't that interesting. But these really are minor more nit-picky gripes. I still had a blast playing a Paladin/Rogue and tinkering with all the in-game benefits of the open-ended nature. I did feel cheated in the end, though to have this highly customized character get a generic farewell. Better than average, but at the same time nowhere near one my all time favorites either. Definitely a fun game, though.